As the Minions have become something of an unofficial mascots for Illumination Entertainment, it should come as no surprise that their original franchise has returned for a third outing. Their inclusion in Despicable Me 3 also feels somewhat forced, providing a sub-plot that has little to no connection with the main storyline. 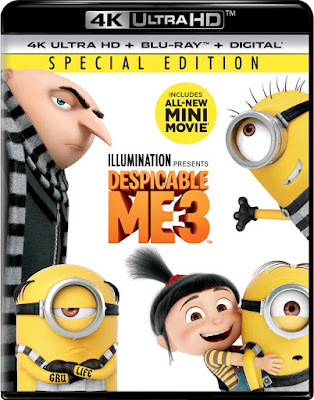 This disjointed portion of the narrative may seem out of place, kind of like a Minion sequel blended with the Despicable Me storyline, but it provides a welcome relief from multiple super-villain schemes, including a double dose of Steve Carell. Having redeemed the character of Gru (voiced by Carell) in the previous films, at the beginning of the third he is working to take down villains instead of being one himself. After a mission to stop former child star turned 80’s-themed villain Balthazar Bratt (Trey Parker) fails miserably, Gru is fired from the Anti-Villains League, with Lucy (Kristen Wiig) loyally leaving alongside him. Gru is uncertain what to do, until he discovers the existence of a long-lost twin brother named Dru (also Carell, with a slightly different voice). Dru has hopes of continuing the family legacy of being a villain, though he lacks even the same competence as the Gru from the first Despicable Me film. When Dru proposes that he and Gru team up as a super-villain team, our reformed bad guy must decide whether to return to a life of crime. They plan a heist to steal a diamond from Bratt, which also happens to be the same diamond which resulted in Gru and Lucy being fired. He keeps the mission a secret from Lucy, suggesting that he may be considering going back to his evil ways, but also keeps the significance of the diamond from his brother, suggesting that he could be planning to use the stolen jewel to get back into the Anti-Villains League. The morality of his final choice is kept somewhat mysterious, though even younger children will likely predict where the film is heading. Predictable as it may be, Despicable Me 3 energetically gives the audience what it has come to expect from the franchise. It draws from comical slapstick classics for inspiration, often feeling like an amalgamation of The Pink Panther, Spy vs. Spy, and an assortment of different Looney Tunes cartoons. This is mildly amusing, for the most part, though it may fray the nerves of some parents during its most frantic of sequences. The Minions, as always, provide a welcome relief from the constant barrage of Gru/Dru/Bratt shenanigans, though their journey veers a little too far from the main storyline after deciding to abandon Gru in search of another villain. Animated films are fantastic for showcasing the latest technology, and this is true of 4K Ultra HD presentations. Unfortunately, Despicable Me 3 is no more groundbreaking in its animation than it is in its storytelling. This is not to say that the animation is disappointing, because it is more than serviceable, but not quite as impressive on 4K as one might hope. Even still, there is a noticeable upgrade in the visuals, from sharper detail to a higher range of colors. This is especially noticeable in the presentation of Bratt’s colorful 80’s style and panache. The 4K disc also comes with a mini-movie, The Secret Life of Kyle, with the remainder of the special features included on the Blu-ray disc. The Blu-ray also has several additional Minion Moments, which are basically just minute-long short films, and a handful of deleted scenes. 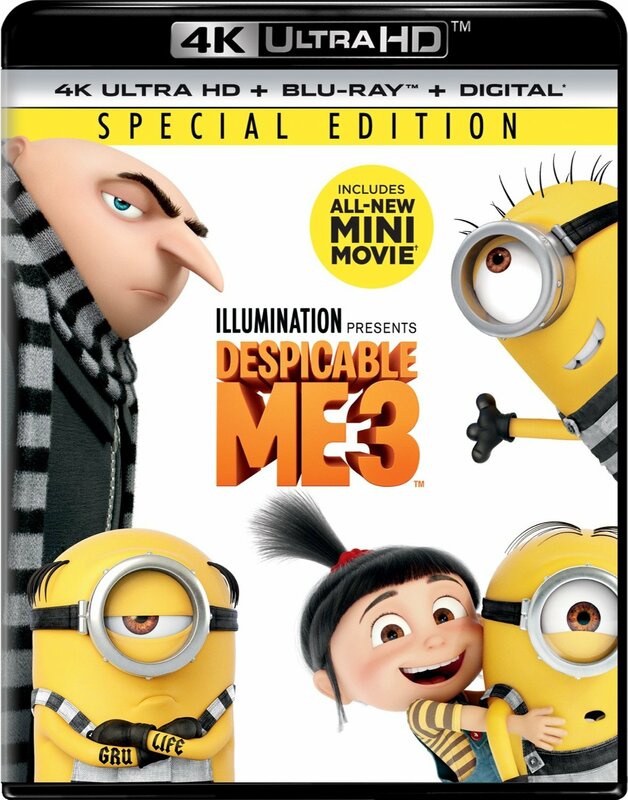 Aside from the extra footage, the Blu-ray also has character profiles, mug shots and wanted posters of Minions, a music video, and a making-of featurette. There are also several interactive featurettes for the younger viewers, including a short sing-long from a section in the film. The 4K Ultra HD release also comes with a digital copy of the film.